I recently finished sewing binding on the King-sized anniversary quilt… and last week I started sewing the hexies for the dragon quilt together. Guess what? I now have some very nice calluses on my little fingers… it makes it SO much nicer to hand stitch anything! I just wish that you didn’t have to go through a week of soreness before the calluses come! Oh well ~ it’s worth it! I’m sewing this in strips that run diagonally in the dragon. I’m excited to be at this point ~ now I just wish I could sew faster. I really have to pace it though… my hand and finger joints can only handle so much. I did find this awesome ointment called Traumeel ~ it has arnica in it and it helps my joint pain immensely. I just found your blog – I'm in awe of your hex quilts. 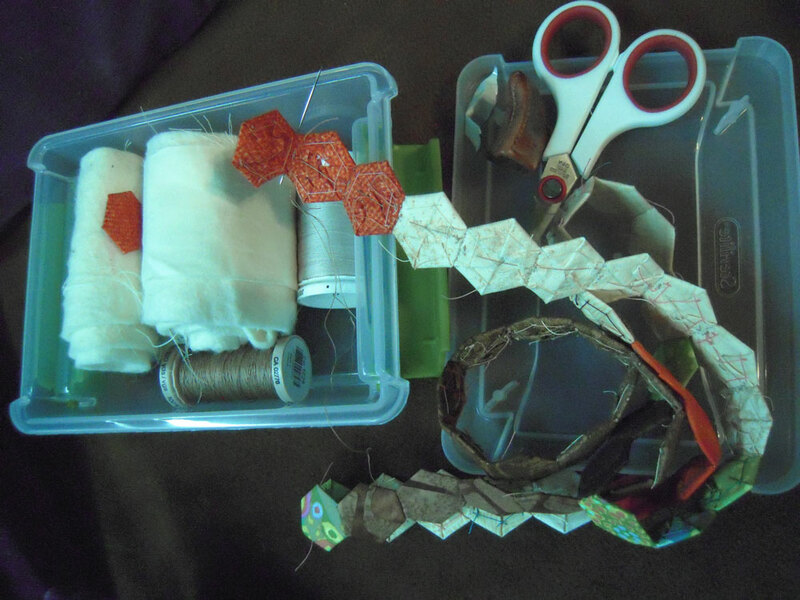 I've only just started with hexies, and I love how you've broken out of the flower mould. I've been wondering about your design process (I had a quick look, forgive me if I missed the post!) – how did you chart out the dragon and squid? Is there software you used? Any tips and tricks to pass on? Gorgeous! People say I have immense patience for the bead work I do… I say you have immense patience for sewing all these hexes together! I'm looking forward to seeing the finished project! can't wait to see your little kit this week! a drop of superglue on the relevant spot helps a lot while the calluses are building up. You'll still get a callus but it won't be so painful the whole time. I use it when I haven't played guitar in a relly long time. I bet you'll have some serious calluses after this endeavor! I'm looking forward to seeing the quilt (and the calluses).